Contains 16 x 8W Mega Bright quad-colour LEDs. Since each individual LED incorporates red, green, blue and white chips behind a single lens, shadows and unevenness within the field are things of the past. An advanced LCD control panel gives the ability to run the built-in programmes and perform full RGBW colour mixing with or without DMX control. Power and DMX in at one end and out at the other provide simple cable management. Utilising Quad RGBW LED technology the LEDJ Q Colour adds washes of colour to stages and performers. 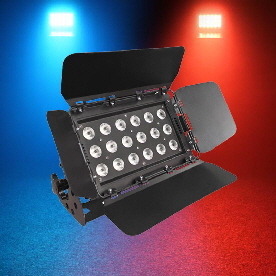 Since each individual LED incorporates a red, green, blue and white chip behind a single lens, shadowing and unevenness within the field are things of the past and like the other fixtures in LEDJ's Quad product line, it also sports a rugged chassis and provides exceptional quality, coverage and ease of use. 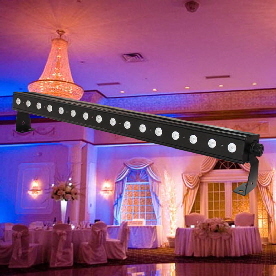 With the ability to run built-in programmes and perform full RGBW colour mixing with or without DMX control the fixture is perfect for architectural work and installation as well.